As you may have heard, climate change has been in the news lately. Here is what we will say about that: the same thing we have been saying. Which is: generally speaking, taking transit occasionally instead of driving alone is a good way to reduce your carbon footprint — i.e. the amount of greenhouse gases (GHGs) that contribute to climate change. I will not bore you with too many words. I will instead treat you to some nifty visuals. Including the one above. Even if you don’t want to read this entire post, take a few seconds and absorb that one. 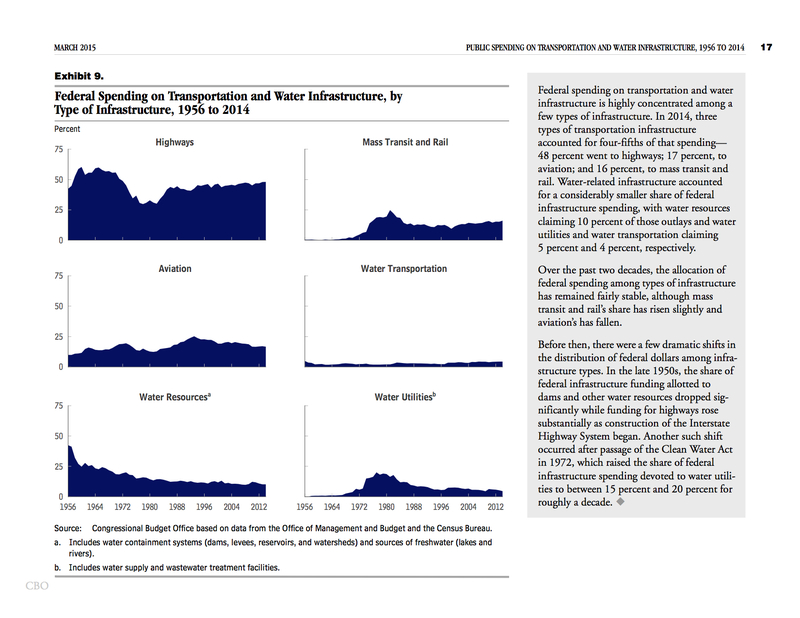 The graphic is from the Federal Transit Administration (it’s reprinted in this report by the Transportation Research Board of the National Academies). It’s from 2009 so things have changed a bit — vehicles have become more fuel efficient and more of the electricity that powers Metro’s trains is being created from renewable sources. But the gist of it holds up. Yes, those numbers depend on how many passengers are in the above vehicles. Pleasant reminder: buses and trains are really good at carrying a lot of people, just as walking and biking are good at producing zero tailpipe emissions! 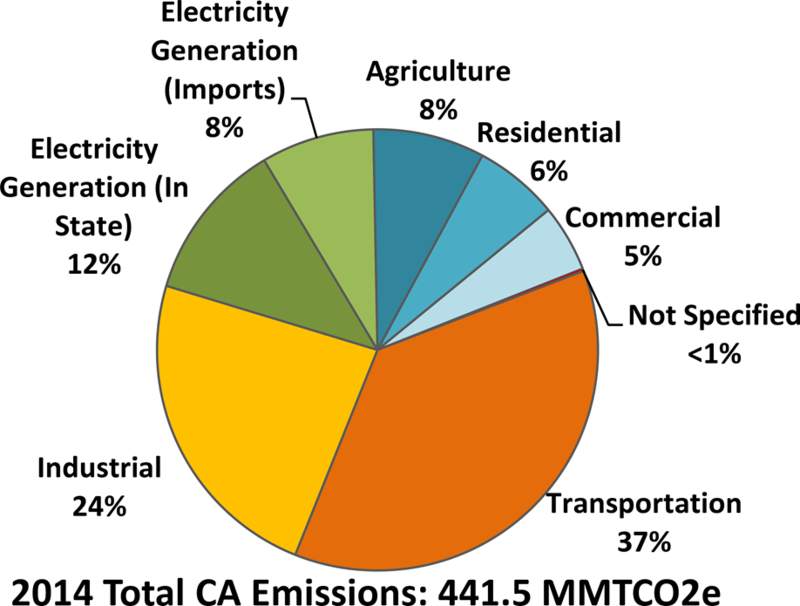 Okay, so there you have it: transpo is the biggest contributor of GHGs in our state. Not exactly a shocker when you consider there are nearly 39.1 million people in California and about 34.3 million registered vehicles in the state. 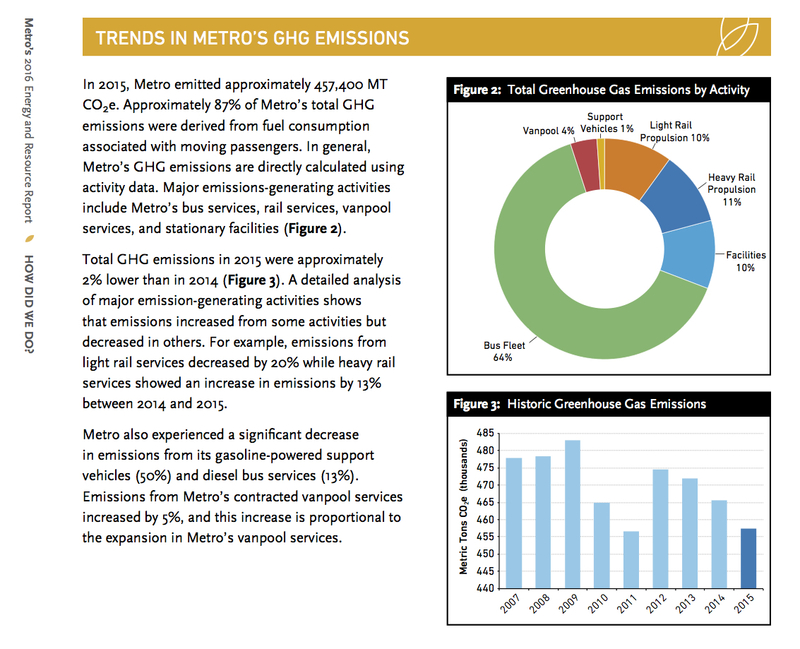 Four recent studies have estimated the net amount of GHG emissions that U.S. transit services save each year. 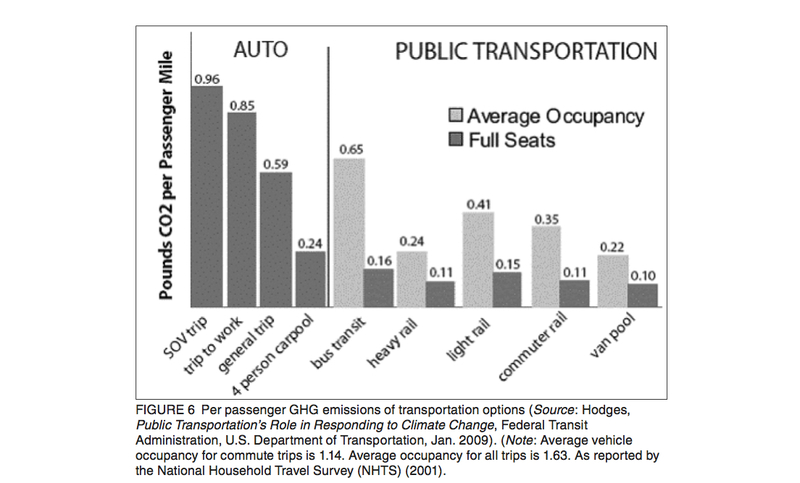 All have found that American public transit significantly reduces GHG emissions from the transportation sector. 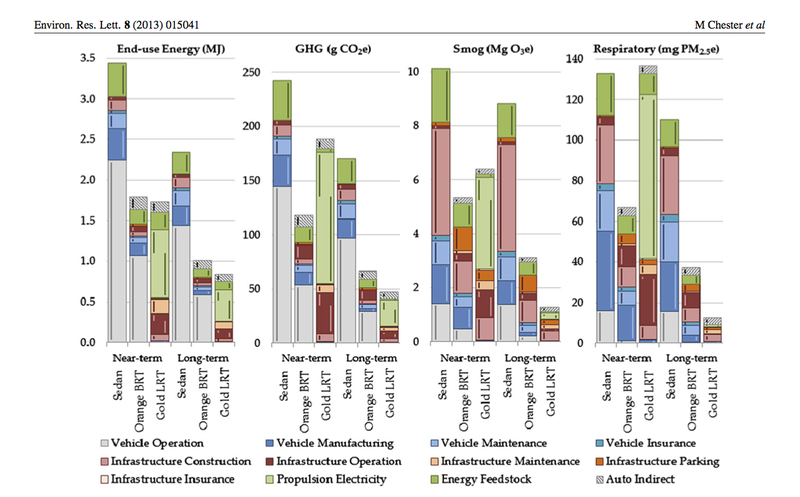 Each of the studies accounted for the travel mode shift effect of transit and for transit vehicles’ emissions. 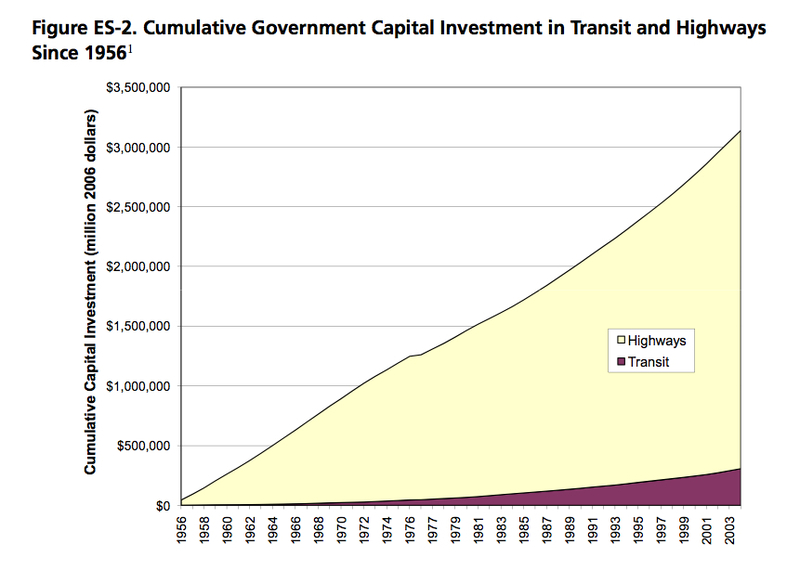 Some of the studies also accounted for the compact development and congestion mitigation effects of transit. The report also shows that some riders stop driving in order to ride buses, trains and vanpools. This is a small chart but a BIG point! 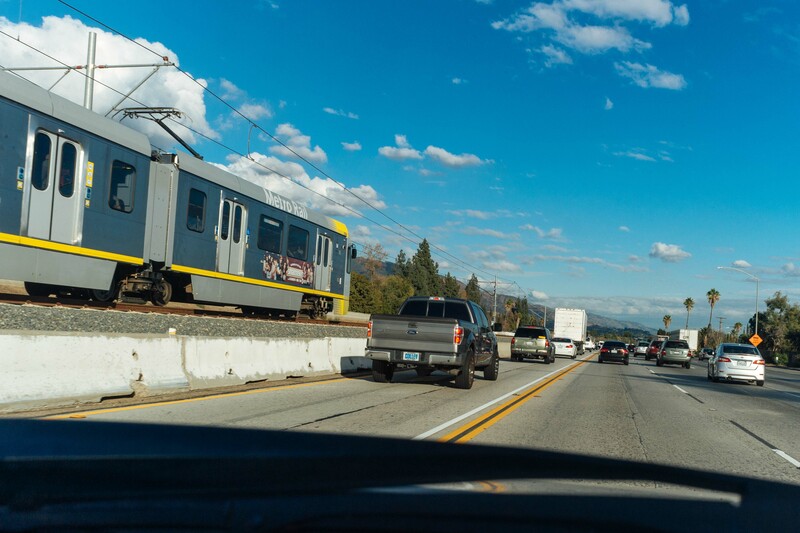 The NYT’s editorial board cited the above in an editorial Sunday pointing to why so many regions are pursuing their own local transportation dollars through ballot initiatives such as Measure R and Measure M, approved by Los Angeles County voters in 2008 and 2016, respectively. Another inconvenient truth: per capita Americans emit more greenhouse gases than any other country in the world (here’s an interactive version of the map). Look, people. I’m not saying transit is all rainbows when it comes to greenhouse gas emissions. Buses and trains, too, rely on fossil fuels. 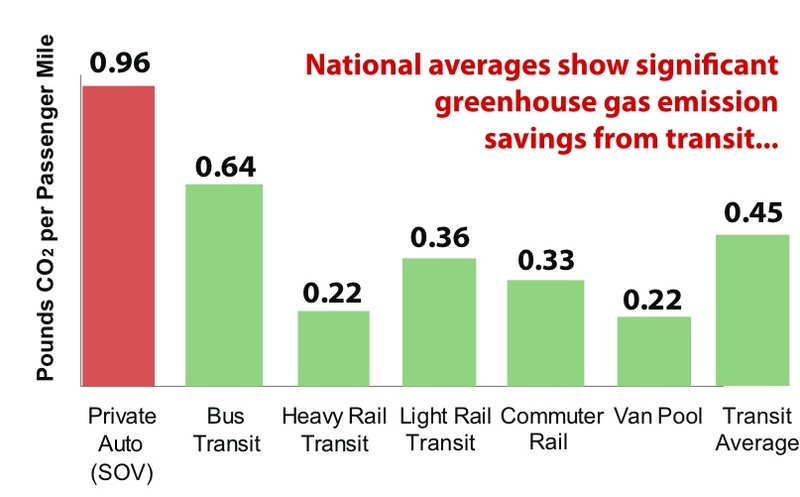 But when it comes to burping out GHGs, transit does so more efficiently than someone driving alone in a car. And that’s something to chew on next time you consider leaving the car at home or must decide whether expanding transit is worth it. Look, people. I’m not saying transit is all rainbows when it comes to greenhouse gas emissions. Metro’s buses and trains, too, still rely on fossil fuels whether it’s compressed natural gas used by buses or electricity created by burning natural gas. (Metro will soon begin fueling some of its buses using biomethane — a type of gas produced with fewer GHGs and we are also working to convert the Orange Line to all electric buses by 2020, btw). Like many other people, I struggle to get my brain wrapped around climate change, an issue which truthfully doesn’t really impact my day-to-day life. But one day it could. Or it could greatly impact the lives of others or the species and ecosystems that we rely upon. Maybe the worst predictions will come to pass. Maybe they won’t. But if you’re concerned, there are no shortage of little things everyone can do to reduce greenhouse gas emissions, and many do not require turning our lives upside down to do them. And one of them is this: take the bus or train, even if only occasionally; the LAT says a couple less miles a day driving can make the difference. It may feel like a small or insignificant step, but a lot of steps by many people do add up. 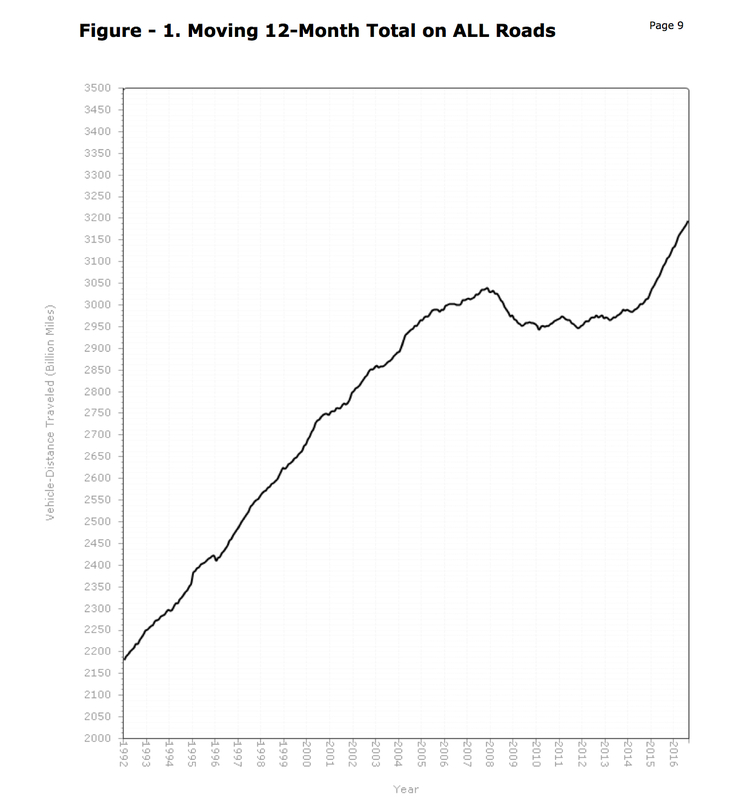 And it’s one more reason having good transit networks makes a lot of good sense. The first part of this post is here and explains the basics of global warming. How fitting that I got an ad on the bottom of my page for solar energy. Has Metro done much looking into solar? It would seem that with the large area on the tops of buses, solar panels could be installed there to help with running the air conditioning. I had mentioned this once before, but never received a response. John Rupkalis, Although there is a large area on top of the buses that area is taken up by the CNG fuel tanks. They used to be under the high floor buses but low floor buses must have them on the roof. Thank you for the explanation. So, what would be the problem with putting solar arrays on top of the CNG fuel tanks? IMO the documentary would have been more persuasive if someone other than a Hollywood actor was the presenter. Far more emphasis on independent sets of data that support the same conclusions might sway some science-deniers. The hoax supporters should visit the Pacific Islanders whose land has been shrinking for 50 years. Don’t forget your tin foil hat and Bigfoot repellent! I don’t mind that he’s a celebrity — and at least he admitted that his lifestyle is part of the problem. As for the deniers, I think at this point playing down to their level is a zero sum game; it’s giving them attention that they haven’t earned. I do think skepticism about big government announcements is a healthy thing for democracies, etc., at some point the deniers have to back up the skepticism with something and they, IMHO, haven’t really done that. As for tin foil hat and Bigfoot repellent, I would like to order two of each please if you can recommend a good source. I do some camping in Nor Cal!